Print checks with one of the most energy-efficient laser printers on the planet. This check printing package includes an HP LaserJet Pro 200 M251nw Color Printer, 1 each of CF211A, CF212A, CF213A Color Toner Cartridges, and 1 CF210X High Yield Modified MICR Toner Cartridge for check printing. This RT CF210X / 131X Modified MICR cartridge was created specifically for the HP LaserJet M251nw printer. 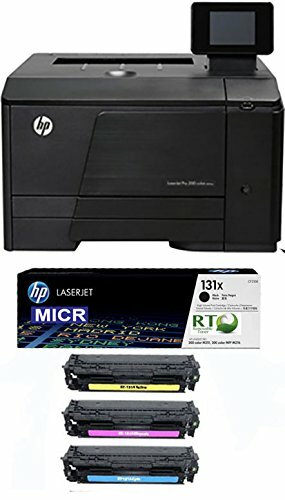 To manufacture this cartridge, RT removed the original toner in an HP cartridge and replaced it with RT MICR toner. RT is the sole manufacturer of this Modified MICR Toner Cartridge. The listing of any RT product is not intended to imply any endorsement or direct affiliation with the OEM trademark owner. Please Note: for your convenience, the cartridges come preloaded into the printer. Check printing software / MICR fonts sold separately. HP's M251nw Printer produces professional quality color documents that help boost business. Printing professional and personal checks is easy with this MICR check printing package from Renewable Toner.